We can do custom K-9 designs for apparel, mugs, decals, patches kennel tags and license plates. Just email us your ideas and we will email you an image of the custom design for your approval. After you approve the finished design, a final PayPal invoice will be emailed to you. 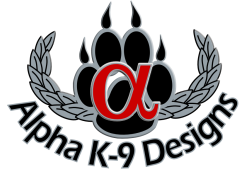 Email your ideas to alphak9designs@gmail.com or fill out the Custom Order Form and we will personally work with you. * Cost for custom designed items are based on quantity ordered. Custom orders may take 3-4 weeks. All customized designs done for you will be saved for future orders. CUSTOM APPAREL REQUESTS: We can mix & match designs and add custom text to our apparel. Pick the designs you want and the placement on the apparel. A PayPal invoice will be emailed to you. Email us your custom request ideas. ﻿CUSTOM DECALS: ﻿ We can create custom K-9 vinyl decals with your text or design idea. Decals are digitally printed on high quality vinyl. Price for custom decals vary based on size and material. No minimum. CUSTOM LICENSE PLATES: Add your own text to our license plates and decals in the Accessories Shop. Let us know what designs you would like to see on a license plate or decal, we will try to make it happen! License plates come in Gloss finish - printed using dye sublimation process. No minimum. CUSTOM VINYL OR EMBROIDERED PATCHES: Add your own text to one of our designs or we can help you with a K-9 design idea. Price for custom vinyl patches are based on size and quantity (no minimum). Price for custom embroidered patches are based on size, stitch count and quantity (50 patch minimum). CUSTOM KENNEL PLATES/TAGS: Kennel tags are printed on 3"x 6" aluminum plates using dye sublimation. Add your K-9's name, brand #, badge #, service dates, or any info to any of our kennel tag designs. Tags take 2-3 weeks production time. No minimum. If you are not satisfied with your order, we will work with you to fix it at no charge. * All custom orders are final once you approve the design unless product is defective. * All custom orders are invoiced through PayPal which accepts all forms of payment with or without a PayPal account.